This post is a continuation of a discussion of “Marie,” a poem by Guillaume Apollinaire set to music by Léo Ferré. “Marie” is a love poem. Apollinaire was romantically involved with Marie Laurencin, a well-known French artist who was a frequent guest in many salons. In the first stanza, Apollinaire writes: “Toutes les cloches sonneront,” if Marie as a grandmother can dance as she did as a young girl. Bells are a powerful symbol. For instance, the line “[t]outes les cloches sonneront” brings to mind “Les trois cloches,” (The Three Bells), a Swiss song written in French by Jean Villard Gilles that won Édith Piaf and les Compagnons de la chanson a great deal of praise. It is the subject-matter of my nearly complete next post. In “Les trois cloches,” bells ring when Jean-François Nicot is baptized. They ring on his wedding day. And they ring at his funeral. These are the key events of his life, our life, and bells ring. Bells, however, church bells, are particularly important in Russia and are one of the distinguishing elements of Russian music. It is not uncommon for Russian composers to imitate the sound of bells in their music or include bells among musical instruments. In Russia, bells, church bells, were/are used for both liturgical and secular purposes This is also the case in the Western Church, but to a much lesser extent. In other words, bells in Russia are little short of an institution. Not all bells produce an identical sound. For instance they differ in size. A large bell is a louder bell. When mixed and depending on the rhythmic pattern, bells may therefore be used to convey a rather wide spectrum of messages, liturgical and secular. Some bells can be heard from afar and transmit a message that other bells can retransmit: D’écho en écho (Les trois cloches). There is an instrument made of bells: the carillon. It may use a large number of bells. Ottawa’s Peace Tower has a carillon of 52 bells (see carillon, Wikipedia), played by Dr Andrea McGrady, the Dominion carillonneur. The carillon is an instrument that reminds me of a church organ. There are carillons all over the world and in places such as university campuses and parliaments. In Germany, a carillon is called a Glockenspiel. Elsewhere a Glockenspiel resembles a zylophone. In Victor Hugo‘s Notre-Dame de Paris (The Hunchback of Notre-Dame), published in 1831, the cathedral’s bells are central to the novel. Quasimodo, the hunchback, is brought up to be the bell-ringer and swings from a rope to save Esméralda from the gallows. But let us return to Russia. 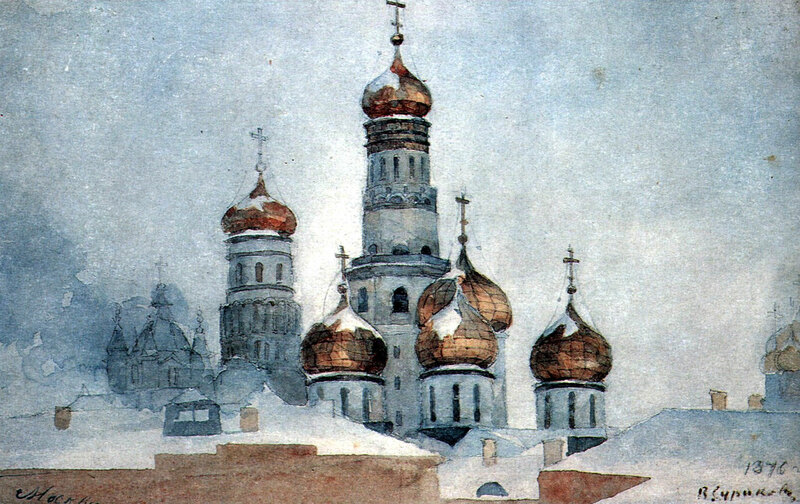 Although church bells are used in many cultures, for both liturgical and secular purposes, in Russia, they play a more central role than they do in the Western Church. However, the phenomenon I wish to emphasize is, first, their being imitated in music and, second, their being used as a musical instrument. Rachmaninov and Tchaikovsky composed music which, unlike the compositions of the Group of Five, did not attempt to be a national idiom, which does not mean that their music is not Russian. It features bells. A discussion of bells could lead to a very long post. For the time being, let us note that Russian composers use musical instruments to reproduce the sound of bells ringing and that they may used bells as instruments. As we have seen above, there is an instrument made of bells: the carillon. However, we will listen to two works for the piano composed by Sergei Rachmaninov and imitating the sound of bells. We will also listen to Tchaikovsky’s 1812 Overture: bells and cannons. The very end of Sergei Rachmaninov‘s Prelude in C-sharp minor 🎶 (Op. 3/2) the sound of bells. One may not hear the bells immediately, but we are definitely listening to a reproduction of the sound of bells in a piece for the piano. I am including a performance by Russian-born pianist Vladimir Ashkenazy. The 1812 Overture, with chimes and cannons, is a celebration of the defeat of Napoléon‘s Grande Armée in Russia. An excerpt of the 1812 Overture closes this post. Apollinaire is one of my favorite French poets (Zone is my favorite of his poems). I didn’t know bells featured so prominently in Russian music. Fascinating post! In Russia, bells are important. I thank it has to do with distance. It’s a huge country and using bells was a way of communicating. They than incorporated bells in their music. I love Apollinaire. I feel he belongs to the whole world. “Zone” is beautiful, and so is the very famous but so simple “Sous le pont Mirabeau.” It is also about Marie Laurencin. She was loved by many men, but she preferred women and may never have known she did. It was another age. What a beautiful woman. She was very successful as an artist. Great post (and musical selections, as usual). In Paris, my son, then 5, and I went all the way to the top of the Notre Dame Cathedral, and saw the upper inner workings of its organ, designed and constructed by a supposedly ancestor of ours. It was a beautiful adventure, all the way up, with breathtaking view of Paris in an early afternoon as a reward. Bells do remind most people of churches and devotion, which is a good thing because once they were also equally evocative of wars and battles. Oh, I think I’ve just found one good thing that may be better about our current times than previous ones. That’s so rare and precious. Thanks for that, Micheline. Wesley, It could that the organ at Notre-Dame was constructed by one of your ancestors and I glad you took you son to visit it. He’s seen a treasure, a genuine world heritage site, whether or not the fact is official. Your son he will never forget this visit. A few years ago, it was cleaned. Imagine the task. I followed that drama! Bells are a significant chapter in the Western Church and the Orthodox Church. They belong to a category closely related to Books of Hours. Humans everywhere have a need to mark events and the time of day. It’s part of our collective instinct. Look at the Muslim world. I thank you so much for writing. I have lived the breathtaking view of Paris from the belfry of Notre-Dame and attended Mass at Notre-Dame on several occasions keeping in mind that life may not afford me that pleasure in later years. Bells are heard in Russian music. In so vast a land as Russia, they no doubt served as a form of telegraphy. Grimaud, la belle Hélène, is a gift to music.